Same Same But Different: All You Need To Know About The Palazzo & Its Cousin, The Sharara! Summer is here and with it is the need to stay cool as the temperatures rise. Keeping it stylish can be a tricky task, especially if you are have run out of skirts and shorts to wear. 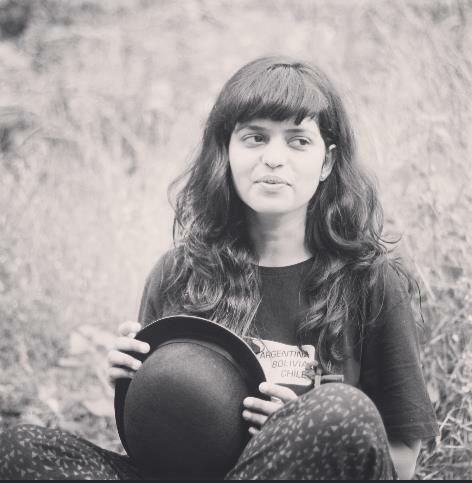 So what does one indulge in, when stuck in a rut in terms of summer clothing? Might we suggest the palazzo? Before you say that it's just a trouser, let us assure you that it's so much more! 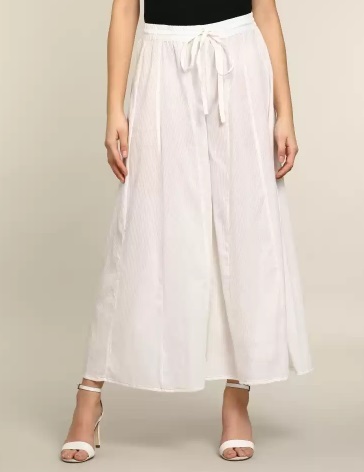 Combining the comfort of a trouser and the feminity of a skirt, the palazzo can very well be your saviour this summer. And if going traditional is what's on the cards, you can always opt for a sharara. Which brings us to the all-important question: what exactly is the difference between palazzos and shararas? You might say that they are almost the same with a few minor difference. 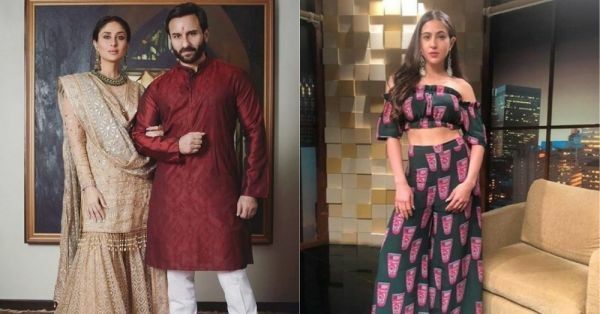 Now that we are here, let us discuss in depth the difference between palazzos and shararas, along with what the two categories really are, their varied types and finally, how to style them in the best way possible. Delve right in, and then get your summer wardrobe sorted. 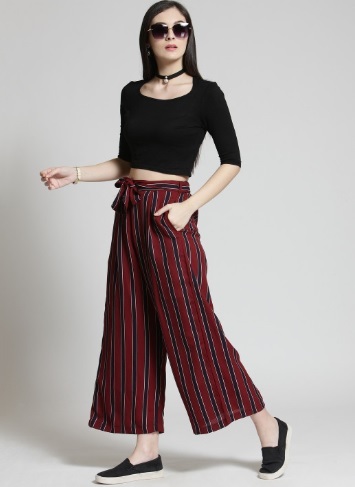 Palazzo pants or palazzos as they are popularly known as, are wide-legged trousers that are breezy and flared. The cut of a palazzo is wide and relaxed, making it a comfortable wardrobe option, especially in the hotter months of the year. Loose, flared and supremely comfortable, palazzos are quite easily the go-to option for a comfortable yet striking OTTD that leaves a mark. If you thought that the category was restricted to just one kind of style, we urge you to think again! 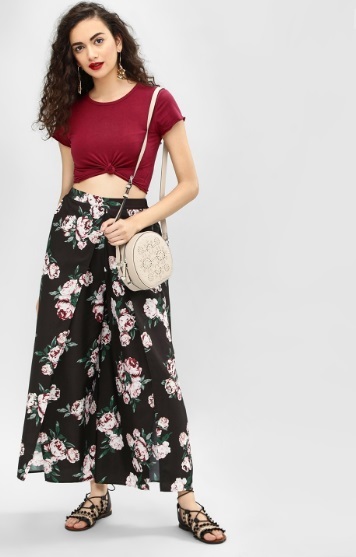 As the name suggests, a straight cut palazzo is fuss-free and simple and can be paired with a variety of clothing essentials, ranging from your basic tops and tees to the more elaborate kurtas. Comfortable and striking, flared palazzos have more room than the basic versions that are wide-legged but are relatively sleeker than the flared options. 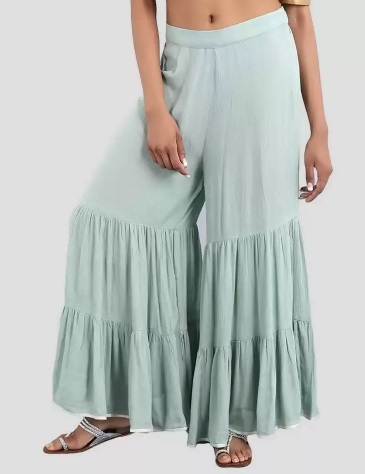 In case you wish to experiment further, opt for flared palazzos that incorporate ruffles and additional design elements. Keep the emphasis on your stylish palazzo by pairing it with a solid coloured top. Pleated palazzos too have different types that can be worn and styled according to the occasion. From basic pleats to detailed engineered pleats, there is a plethora of options you can pick from. What's more, these will take you from the desk to dinner in no time! 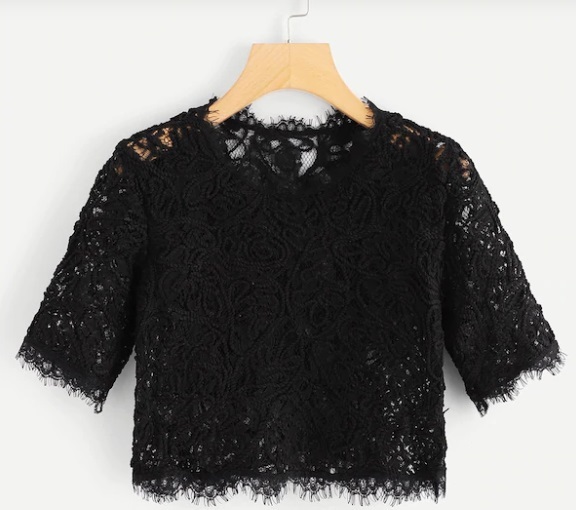 Pair your pick with a lace top and you'll nail that effortlessly chic style. 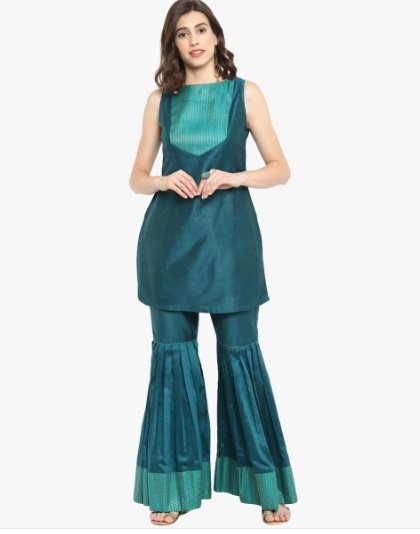 Surprised to hear that there is also a category of palazzos called the layered palazzo? Don't be! 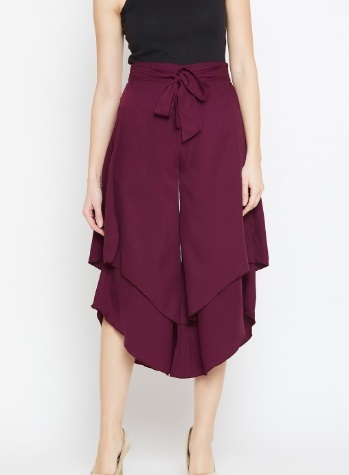 The layered palazzo forms a great wearable option if you happen to be tired of repeatedly wearing skirts. 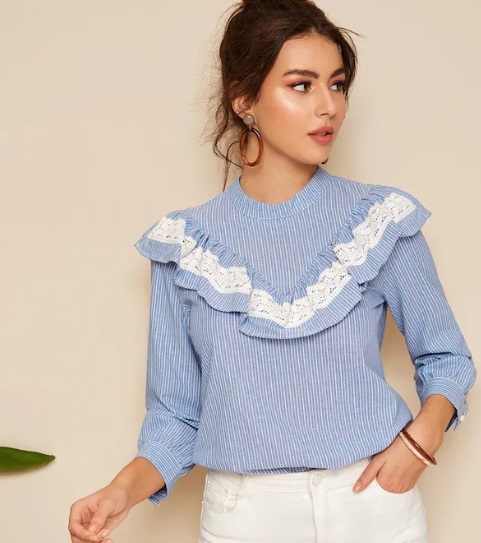 With layered palazzos, you can experiment all you want with your look, wearing it with a fancy embellished top for a party or with a striped shirt for a meeting. Last but not least, the slit palazzo features a slit, mostly on the side seams and sometimes the front. Depending on how edgy you want your appearance to be, you can select how high you wish the slit to be. For a work-appropriate look, stick to a minimum, barely-there cut, and choose to go all out for a party or a casual event. Also lying in the category of wide-legged bottoms, the sharara is most often worn in traditional settings- think weddings, functions and more. 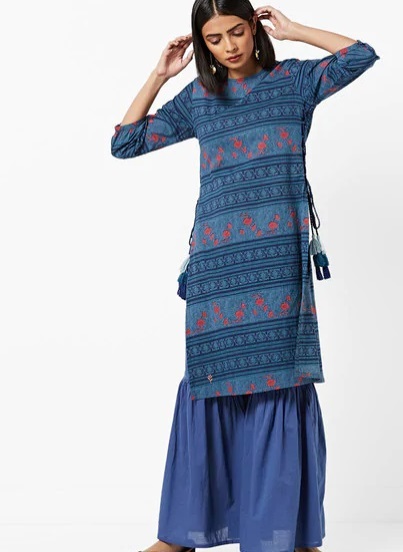 Accompanied by a short kurta, the sharara generally is of a floor-sweeping length. So how is it any different from the palazzo then? To begin with, the sharara can be thought of as a pair of flared pants with joints at or below the knee. While the part above the knee is semi-fitted, the lower half of it is heavily pleated and flared. Also important to note is that the outfit is different from the gharara, which is joined above the knee. 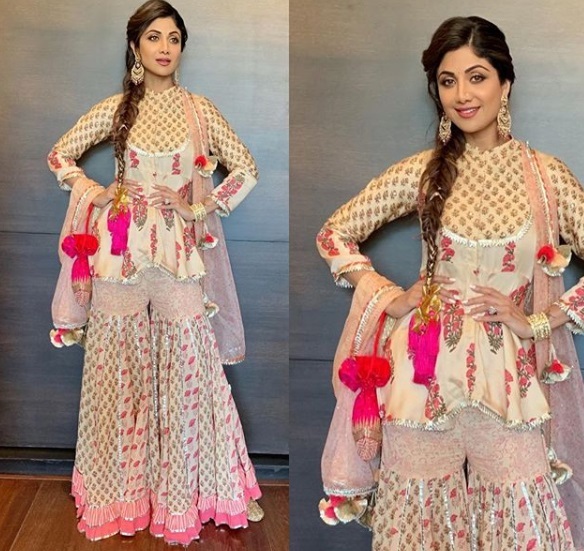 The sharara is said to have originated during the Mughal period, where the royalty influenced the way clothes were worn and fashion trickled down to the masses. In the present day, shararas are generally worn with short kurtas and accompanied by dupattas. 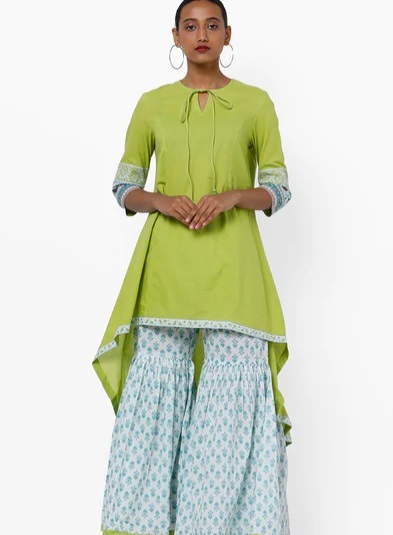 A rising trend in ceremonial wear, the sharara is a fashionable option if you wish to make a mark. If you want to make heads turn with this festive-wear option on your next outing, we've got all the deets on the different types of shararas. From the embroidered sharara to net sharara, know all there is and be prepared to shop the best kind! Embroidered shararas can be worn effectively for your BFF's wedding and pre-wedding functions. If standing out from the crowd in what you wish for, we suggest you give it a go. Like going OTT? We got your back! Make it fashionable in an embellished sharara as you step out looking like a million bucks for that big, fat Indian wedding. Yes, you read that right! Printed shararas are a thing and they are all you need to elevate your style if a day wedding or a party is on the cards. Carry a breezy dupatta to match your look and voila, you are ready! Ever thought of giving the net sharara a go? This might be the perfect time to indulge in the dainty shararas that will give you them princessy feels. 1. To recap, the major difference between palazzos and shararas is that the former is moderately flared, while the latter is fitted at the top and heavily flared knee down. 2. Another difference between palazzos and shararas is the types of fabrics used. 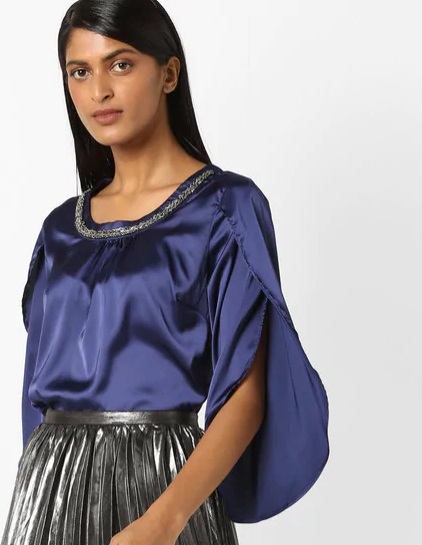 In palazzos, you will generally find lightweight fabrics such as chiffon and georgette being used, while shararas are generally heavy and the usage of fabrics is in accordance. 3. 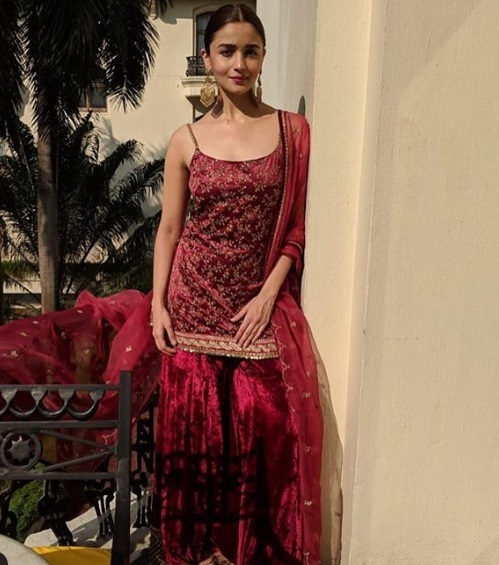 When it comes to the difference between palazzos and shararas, the first forms a part of western ensembles, while the sharara is a traditional outfit, that can also be worn in a contemporary fashion. Here are a few important style tips if that will help you wear a palazzo or a sharara in a fashionable manner. 1. 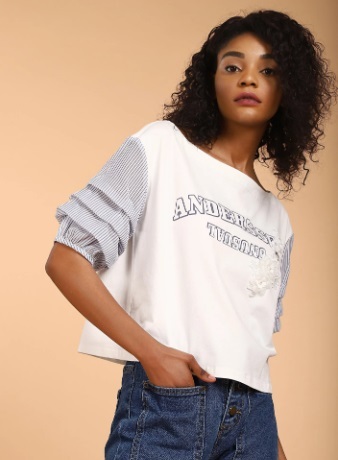 While wearing an elaborate type of frilled palazzo, layered palazzo or excessively flared palazzo, make sure that your top is not too OTT. Stick to basic tees in a solid colour, smart blouses and subtle tops. 2. When keeping the palazzo or sharara simple, pay attention to the top of choice. Choose from lace-detailed tops and embroidered tops for the first, along with elaborate kurtas to be worn with your sharara. 3. Accessorise freely, but make sure that they are in sync with your outfit. Match your jewellery to the colour of embellishments on your clothing, opting for silver, rust or gold jewellery accordingly. 4. Go for moderate heels or flats when styling your palazzo, opting for jootis or traditional mojris to be teamed with your sharara. Now that you know everything there is to know about palazzos and shararas, all you gotta do now is add to cart!